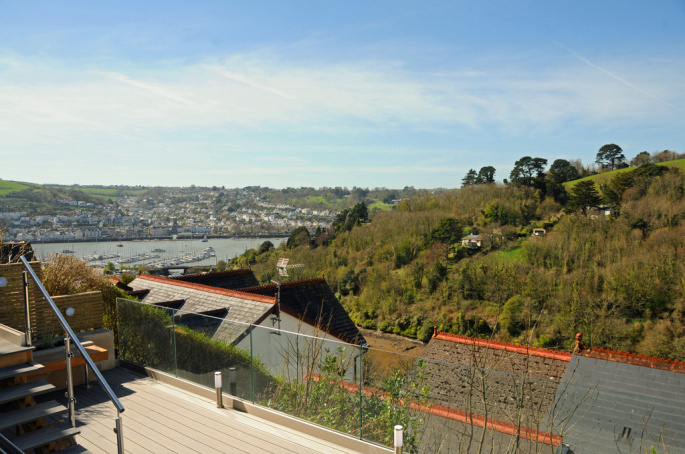 Stunning contemporary designed three bed duplex apartment built to exacting standards with magnificent River Dart and countryside views. 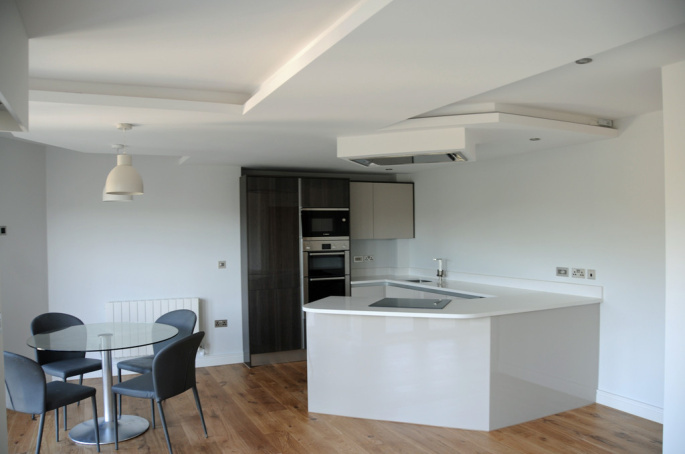 One of only two apartments in this new development, Apartment 2 benefits from large open plan living/kitchen opening onto the spacious garden terraces ideal for al fresco dining. Garage and parking. 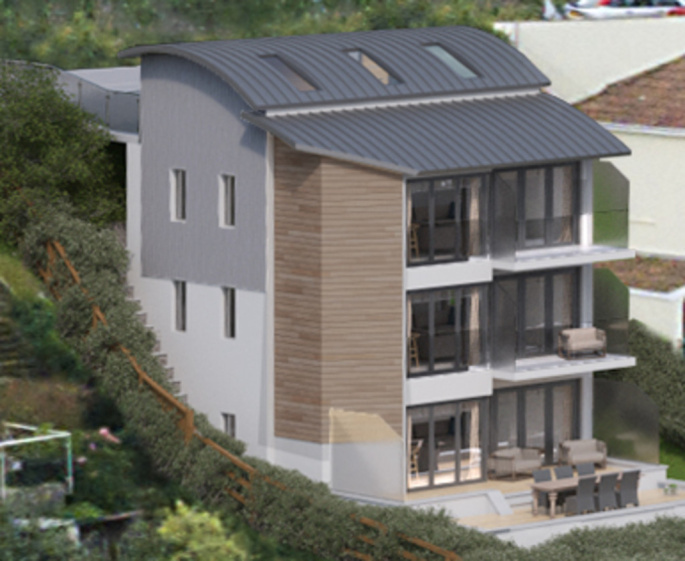 Oceana is a stunning new development situated in the sought-after village of Kingswear by the entrance to the River Dart. 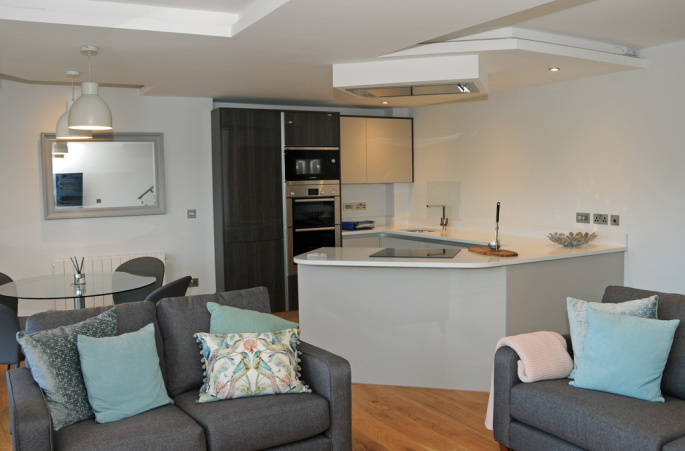 One of only two apartments in this contemporary designed building, Apartment 2 is a stunning three bedroom duplex built to exacting standards with high quality fittings and fixtures. 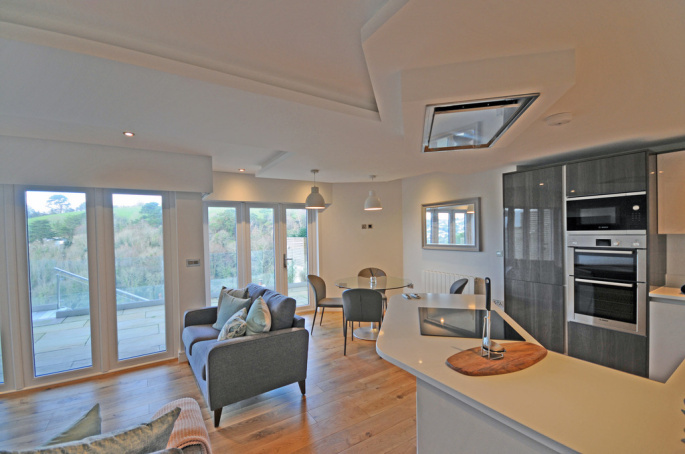 The spacious open plan kitchen/diner and lounge opens out onto a spectacular terrace with panoramic river and rural views. 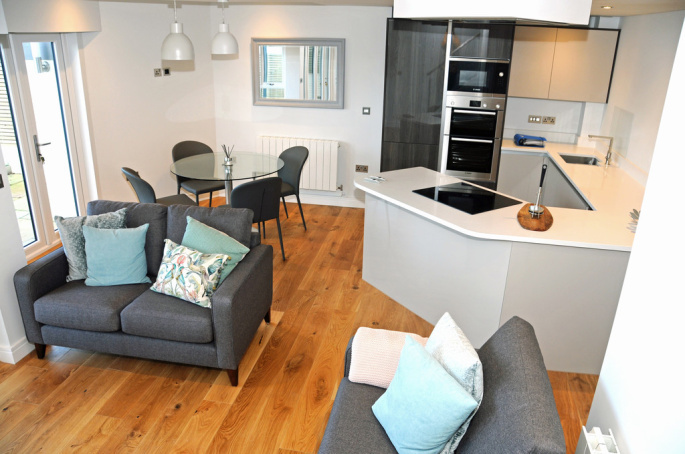 The master bedroom has an ensuite and balcony from which to enjoy the glorious water and woodland views. 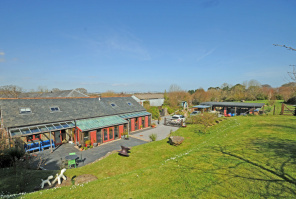 The property also benefits from a single garage, store and forecourt parking. 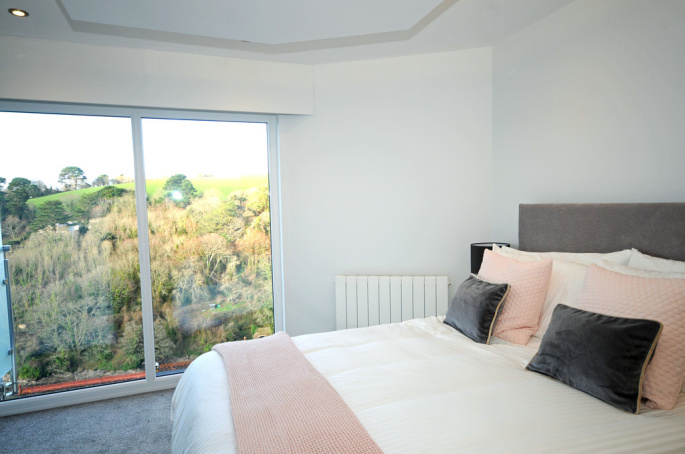 MASTER BEDROOM 12' 3" x 11' 1" (3.73m x 3.38m) Good sized double BEDROOM with fitted carpet, spotlights, TV point, radiator, double glazed window fitted with electric blinds and double glazed door to BALCONY where you can enjoy breakfast overlooking the river. With fitted wardrobes complete with integral lighting and plenty of hanging and shelving space the room also benefits from a stunning ENSUITE SHOWER ROOM comprising large walk-in shower with rain shower head and separate hand held attachment plus glazed shower screen, wall hung wash hand basin with drawer under and large mirror over, low level wall hung w.c., heated chrome towel rail, extractor fan, shaver point and fully tiled walls and floor. Double glazed window to side elevation roller blind. 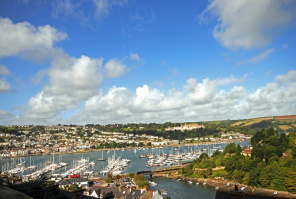 BEDROOM 2 10' 2" x 10' 3" (3.1m x 3.12m) A lovely bright room with double glazed sliding doors out onto the BALCONY overlooking the creek and countryside as well as across to Dartmouth town and the across the marina. 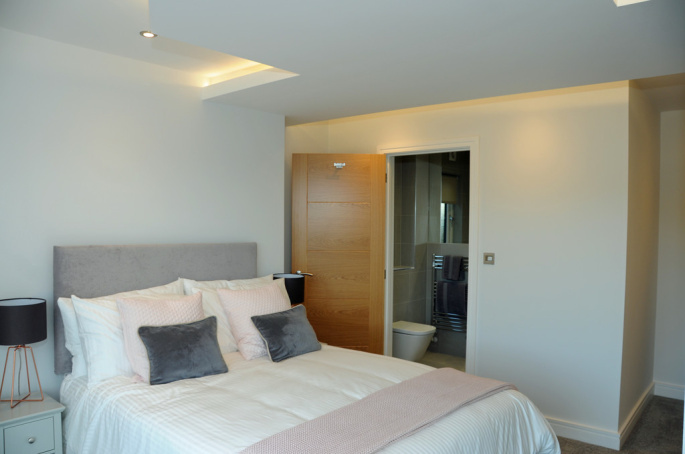 Fitted wardrobes with internal sensor lighting, TV point, feature radiator, carpet and spotlights. 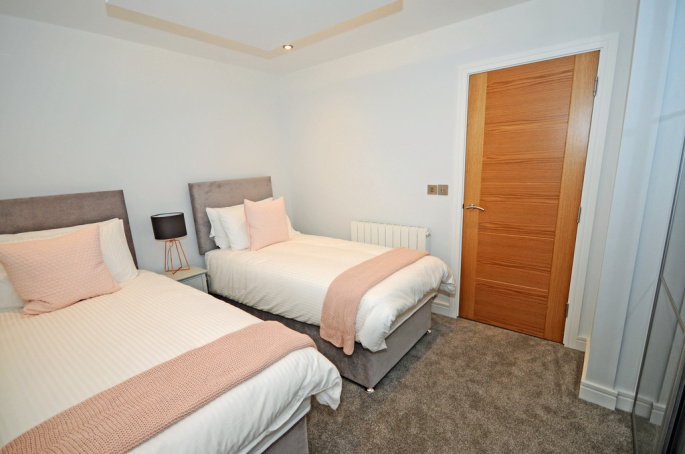 BEDROOM 3 12' 4" x 9' 6" (3.76m x 2.9m) Double BEDROOM with fitted carpet, spotlights, TV point, double glazed window with fitted roller blind to side elevation, radiator and contemporary fitted wardrobes with internal sensor lighting. BATHROOM Fully fitted with contemporary designed porcelain tiles, high quality Roca fixtures and fittings comprising full bath with rainshower over plus movable hand held shower and glazed shower screen, wall hung wash hand basin with drawer under ideal for additional storage, wall hung low level w.c., chrome heated towel rail, shaver point and extractor fan. Spotlights and large mirror make this a very bright space. 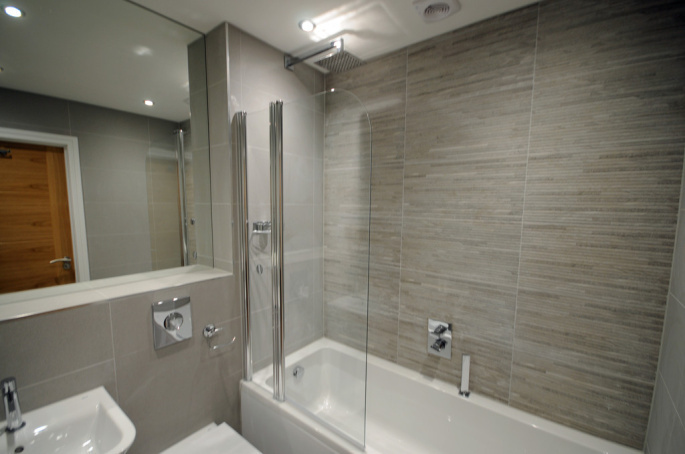 Fully tiled walls and floor. OPEN PLAN LIVING/KITCHEN AREA 17' 0" x 21' 8" (5.18m x 6.6m) From the HALLWAY stairs lead down to the spacious OPEN PLAN AREA with engineered oak flooring throughout, two radiators, spotlights and pendant light fittings and two sets of sliding double glazed patio doors, both with remote control electric blinds, opening onto the spacious TERRACES. Under stairs STORAGE /UTILITY CUPBOARD housing the washer/dryer and shelving with sensor light. KITCHEN/DINER KITCHEN AREA comprises contemporary designed wall and base units with Quartz work surfaces and upstand, integrated Bosch fridge/freezer and separate wine cooler, integrated Bosch dishwasher, 1½ bowl stainless steel sink with drainer and integrated drainer, integrated Bosch double electric oven with microwave above, induction hob with extractor over and breakfast bar. 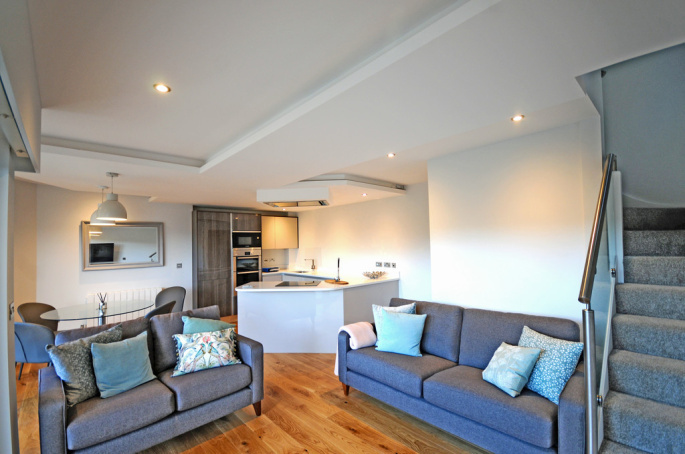 OUTSIDE Beautifully designed garden TERRACES with ample space for al fresco dining and entertaining with built-in bench seating and garden STORE. 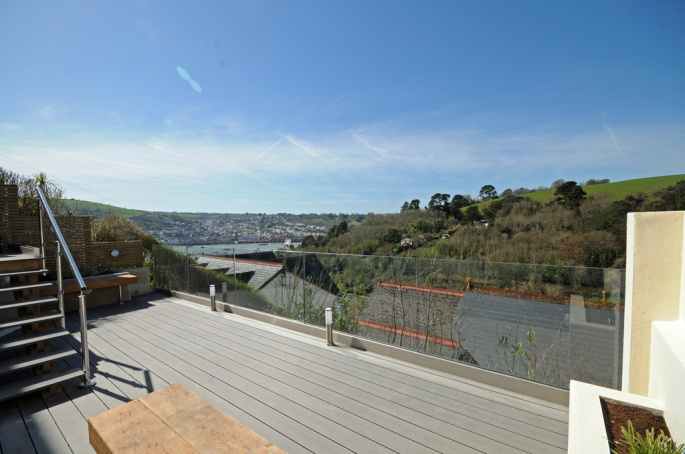 Glass balustrades, outside lighting and magnificent views complete this lovely outdoor space. 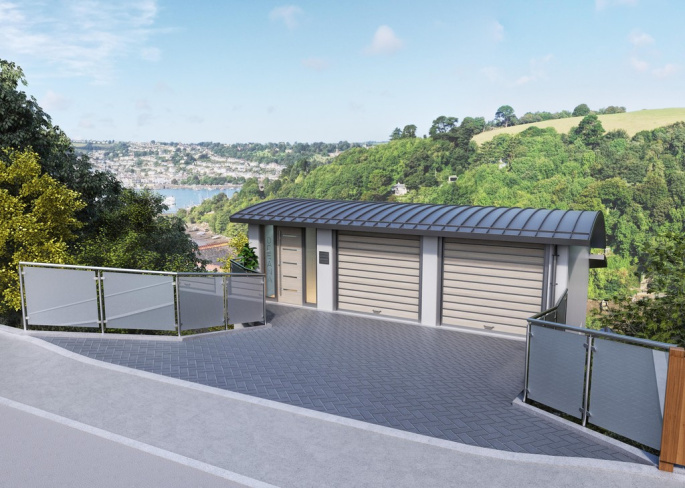 At the entrance level there is an allocated STORE ROOM with lighting and SINGLE GARAGE with remote control electric roller door, strip light, extendable water tap and Velux windows. Viewings: strictly by prior appointment with The Coastal House. 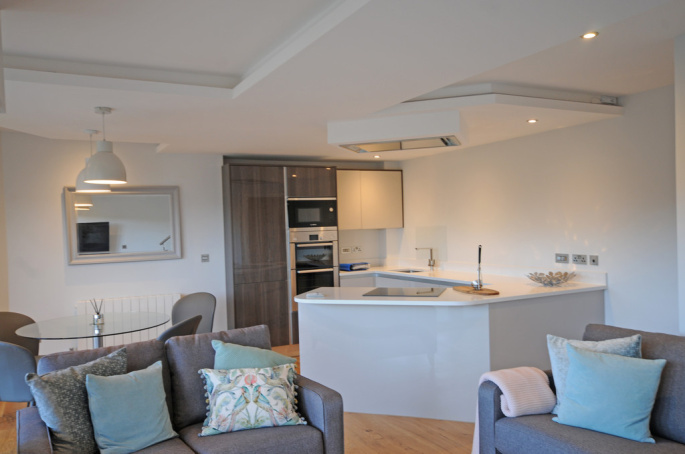 Please contact The Coastal House directly for further information or to arrange a viewing on 01803 752321 or email info@thecoastalhouse.co.uk Please note we do not accept liability for any personal injury or loss as a result of your viewing any of our properties. Important: we would like to inform prospective purchasers that these sales particulars have been prepared as a general guide only and must not be relied upon as statements of fact. Neither The Coastal House nor any joint agent has any authority to make any representations about the property, and accordingly any information given is entirely without responsibility on the part of the agent(s). 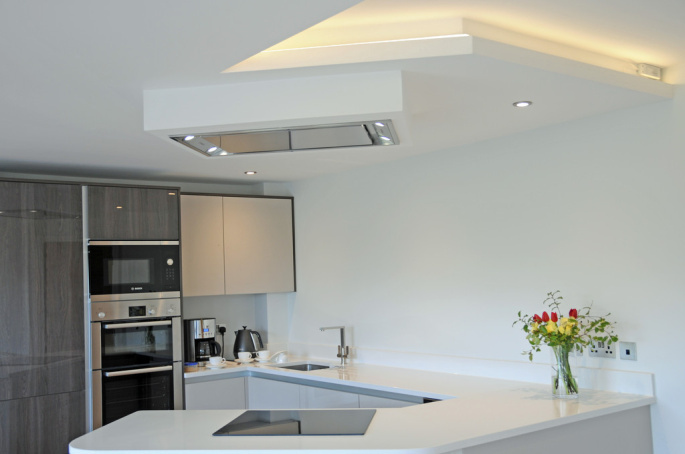 A detailed survey has not been carried out, nor the services, appliances and fittings tested. 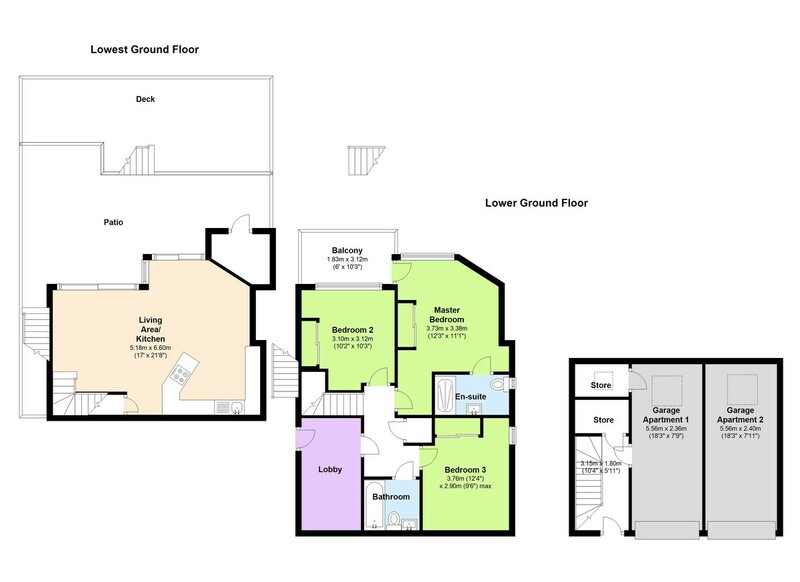 If floor plans are included, they are for guidance and illustration purposes only and may not be to scale and should not be relied upon for furnishing or planning purposes. These particulars, both in writing and/or by word of mouth, are not an offer or contract, nor part of one and should not be relied as being factually accurate about the property, its condition or its value. 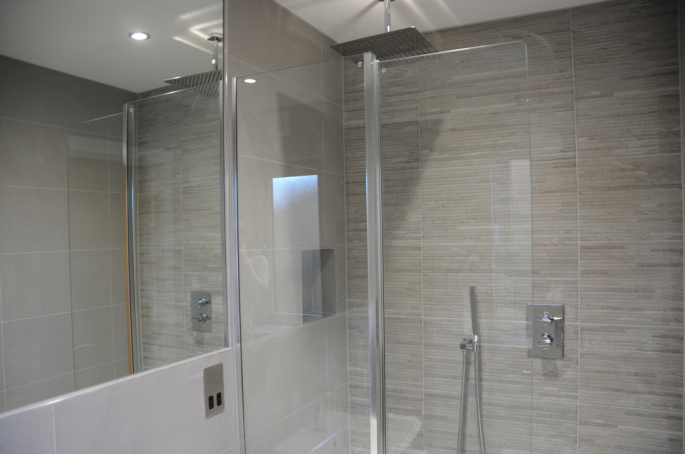 Any reference to alterations to, or use of, any part of the property does not mean that any necessary planning, building regulations or other consent has been obtained. A buyer must find out by inspection or in other ways that these matters have been properly dealt with and that all information is correct. 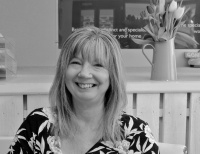 If there are any important matters likely to affect your decision to buy, please contact us before viewing the property and/or seek independent legal advice. 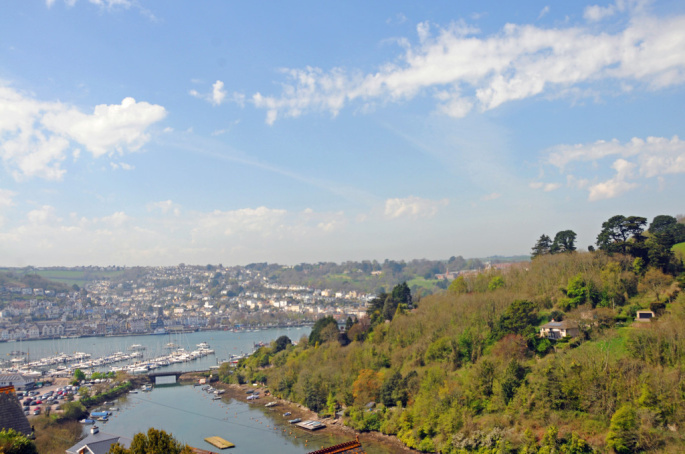 Please note: this property is being offered directly for sale by The Coastal House estate agency in Kingswear, and all information and photographs have been provided by them. As such, Waterside Properties have not inspected the property, and are therefore not able to verify the correctness of any of the statements of fact contained herewith. 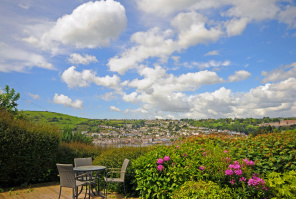 All photographs of views have been taken directly from the property itself. 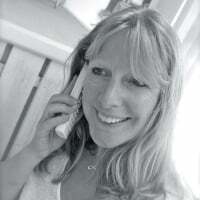 The Coastal House is a limited liability company registered at 14 Mayors Avenue, Dartmouth, Devon TQ6 9NG under no. 9447216 and a member of The Property Ombudsman Scheme. 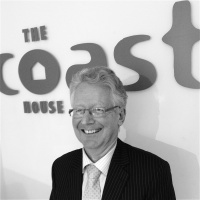 "Over the last 8 years The Coastal House team have found us houses that became our amazing homes & investments that turned a profit. Many thanks for our current view."